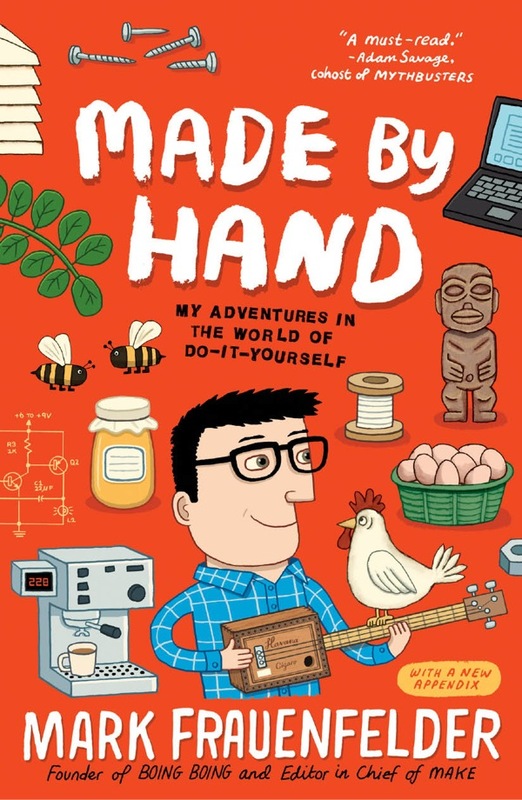 Those lessons partly account for why Made by Hand shows up here on a blog about writing. Writing itself is as much of a DIY process as there is out there. Yes, we are made to believe that we “learn” to write in school, but really we just learn the structures of writing and some specific strategies for putting them into practice. The real work of learning to write is done by the individual him/herself, and it takes years to really develop the craft. Even then, the learning process never stops. With that in mind, there is plenty that Frauenfelder has to offer that can be used by writers, beginning and experts. DIY takes a certain kind of mindset. Frauenfelder sums this up in the title of his first chapter: “The Courage to Screw It Up.” Fear of failure, and all the other things it brings like humiliation and embarrassment, is a very real inhibition for many. It comes up a lot in the literature on motivation and procrastination in education. It’s no surprise then that the first chapter opens with Frauenfelder’s coveting the ability of DIYers seem to take control of their own lives and spaces and doubting his own abilities. He displays a mindset similar to many aspiring writers who look on from the sidelines wishing they could write like their favorite authors. “The Courage to Screw It Up” becomes a rally cry for Frauenfelder. It changes how he sees the potential failure of his efforts. Tearing up his lawn and planting a garden no longer seems undoable because the worst that can happen is he screws it up and has an unsightly mass of mulch in his front yard. Given that the sustainable nature of food and a closer relationship to the land are ideas he strongly believes in, Frauenfelder goes for it, kills his lawn, and turns out a fairly good crop. He also learns the biggest lesson of the book: no mistake can be considered a failure if it can be learned from. This cycle of feeling intimidated by the skills a project demand, determining that it’s ok to develop those in the process of doing the project, and then learning from mistakes repeats for nearly all the projects in the book, which include the aforementioned gardening, raising chickens, beekeeping, and cigar box guitar making, along with making the perfect espresso, brewing kombucha, and tutoring his daughter in math. That’s not to say the cycle is repetitive, or at least unnecessarily so. Frauenfelder gets better at diving in, which partly comes from developing a sense of self that is consistent with the can-do attitude of a DIYer, but the skills he’s practicing get more complicated and the stakes get higher. Failing to grow a tomato from a seedling is a minor emotional let down, but being the man responsible for a chicken or a colony of bees dying has more potential for a tragic ending. The repetition of the cycle is a good reminder that developing good habits and learning new skills takes practice. Just because we logically know that we should have the courage to start a project doesn’t mean that we will always be able to do it. Frauenfelder’s attempts nicely show how putting a new personal philosophy in place takes time. He knows that there are bound to be slip ups along the way. That’s a necessary reminder for those learning to write because so many attempt to create better habits, fail a few times, and then use it as proof that they don’t have the capability to improve. Writers need to understand that in all things, you’re going to have some screw ups. Part of what makes the screw ups bearable for Frauenfelder are the networks of people he connects with throughout each project. When he doesn’t know how to do something, his first resource always seems to be the internet, which frequently presents a more expensive or time consuming solution. Eventually, through networking with other DIYers, he finds that their knowledge and experience is much more valuable than what he can find on the internet. His projects seem to go more smoothly (or at least through the planning stage) mostly because he starts getting involved with experts in the field. As a teacher, I have to say that the chapter that I was most looking forward to reading was a bit of a let down. In the table of contents, the ninth and final chapter before the conclusion is called “Learning to Learn.” As those who read the blog can guess, it is not surprising that I like the idea that someone would come to a final epiphany that the task of getting better at something is based on learning how to learn better in ways that are much more tailored to their own needs. So much of conventional education is based on principles that are either misunderstood or just plain wrong, so reading the title, I anticipated that Frauenfelder would eventually wind up learning that the process of becoming a DIYer is partly a process of becoming more educated about how he learns. It does not take this path. Instead, the chapter, while focusing on education, tries to make a case for the DIY-approach to educating children, citing a book published by Frauenfelder’s magazine Make, which notes how No Child Left Behind is “killing high school chemistry” because teachers are overly concerned with standardized tests. Frauenfelder talks to some homeschooling parents about their unique approach to educating their children, which they call “unschooling,” decides it’s not for him, and then talks to an expert in education who suggests that the best way for parents to help their kids is to provide “the opportunity to mess around with objects of all sorts, and to try and build things,” which is a phrase he is content to leave on its own right before a section break, understanding that the reader will see the value of the DIY culture. The DIY context for this discussion of education is Frauenfelder’s tutoring of his daughter in math in preparation for a statewide placement test. After the testing goes more poorly than he expected, Frauenfelder has trouble finding meaning in the mistakes as he did in other places in the book. I’m certainly sympathetic to the path he takes; he knows that “faced with a choice of buying into a system I didn’t like or rejecting it entirely, I took a middle road that ended up punishing my daughter.” I am not as satisfied with the direction he takes in commenting on the experience. He notes that he sees his role as supplementing his daughters’ educations by providing “as many undirected, unstructured, play-oriented learning opportunities as possible.” On their formal education, he notes that he’ll “need to accept the fact that [his] kids may sometimes need tutors who train kids to be better test takers.” That comment seems to make assumptions about tutors that I don’t think are always true. The last chapter doesn’t detract from the enjoyment of the book and the lessons that someone who wants to get better at anything can learn. Seeing Frauenfelder try despite fears of failure is inspiring. I won’t be raising chickens or bees any time soon, but that’s for lack of land, not for lack of confidence that I could do it. The big takeaway for readers of the blog is understanding that having the courage to screw things up is an essential part of learning anything. The freedom and opportunity that comes from opening up this mindset grows upon itself, just as Frauenfelder’s confidence in himself grows with each new trial he takes on. That feeling is reward enough in itself to try new things.